A very nice example of this classic Watson stereo, with a very well thought out design. Finished in blue/grey enamel, the turret mounted objectives are x2.5, x5 and x10 and are matched with two pairs of eyepieces - , x10 and x14 giving a magnification range of x25 to x140. The microscope has a jointed quite long flexible light unit that can provide either incident illumination or is potentially long enough to shine light onto the substage mirror system to provide transmitted light. Dating from around 1960 this is a nice instrument. A Baker microscope from the 'heyday' of British microscope manufacture. This is a solid microscope with British engineering at its best. Now without doubt a collectors piece but also a functional optical microscope. 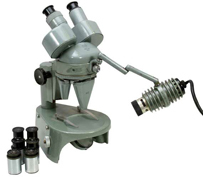 This is an all original microscope with x10, x20 and x40 Baker objectives and x5 Baker eyepieces. Separate coarse and fine focus systems and a full mechanical stage with separate X and Y movement controls. Focusing condenser with iris diaphragm and mirror illumination. The body work is very good. Custom made wooden case with lock and key. A watson service stand only, serial number 90564. No objectives, but complete with condenser and mirror triple turret, plain stage with slide clips. Very good chrome and general body work.. In its day this was probably the microscope of choice for education and schools and there are many used examples. However this one is in very good condition and is now clearly a collectors item. All original with objectives x4, x10, x40 and x100 (oil) with x10 eyepiece. Mechanical stage, condenser with flip top lens coaxial coarse and fine focus. Light unit. This is not a microscope, but an optical system to produce 3D images from 2 photographs that were taken originally from slightly different angles. This type of equipment was very popular in Edwardian times for home use. However this particular unit appears from the case markings to have been used during the 2nd World War to have been used to study bomb damage from ariel photographs. All complete and original with full instructions attached to the lid of the case. A very rare item in excellent condition. A good example of this classic Baker microscope. All original with objectives x3, x10, x40 and x100 (oil immersion) with x10 eyepiece. Mechanical stage with central drop down coaxial controls. Coaxial central coarse and fine focus controls on the base. Focusing substage condenser with centring controls and iris diaphragm. 240v mains illumination. The only negative is a few small paint chips low on the base. This binocular compound microscopes dates from the time when British microscope manufacture was realigning itself. As a result this CTS has some Vickers, Bake and Cooke Baker components. The microscope is all original and in good condition and fully functional. CTS serial number M154147 with x8 compensating eyepieces. Objectives x5 Vickers, x10 Baker, x40 microplan Cooke Baker and x100 (oil) Cooke Baker (numerical aperture 1.30) . Full substage condenser, mechanical stage and light unit (Vickers transformer). Very good condition. The Watson Bactil is in truth an iconic microscope with the earlier models finished in black livery and the later versions in white. This example has the serial number 122220 and is in reasonable condition for its age. An ideal microscope for those starting a collection because this is an 'all original' microscope. Objectives x10, x50 and x100 with x6 eyepieces. Mechanical stage and full substage condenser with iris and filter carrier. This unit has all the mechanical refinement associated with the Bactil 'brand' - the dovetail moving head and the inter papillary adjustment mechanism being just two of these. This microscope dates from the days that the principal microscope manufacturers began to merge their production lines. This Baker microscope is the same shape as Vickers models of the same time. This is all original in in good condition. Objectives x3, x10, x40 and x100 (oil immersion) with a x10 eyepiece. Mechanical stage with coaxial front positioned controls. Full substage condenser with flip top lens. Tungsten illumination. Front coaxial coarse and fine focus controls. A few small chips on the paint work but altogether a nice microscope.